A horde of white beetle taxis and combi vans doing their rounds of the narrow cobblestone streets was the sight that greeted us in Taxco, Mexico. Walking to the historic center from the bus station was a challenge because the only way to go was further up this old mountain town. But we managed to make it all the way up to the Templo de Santa Prisca, the crown jewel of Taxco. But not without exerting so much effort that got me working out a sweat. Mining towns are plentiful in Mexico. 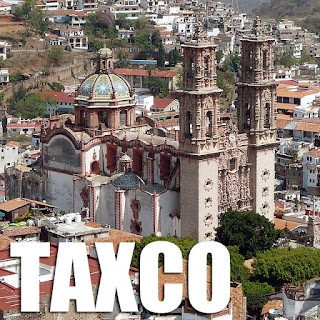 Taxco is said to be the center of the silver-mining heartland of Mexico. 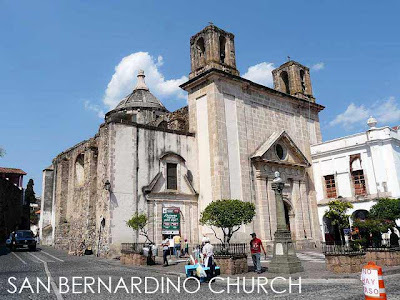 And the most famous resident of this mining town is José de la Borda, who made his fortune in this mining town, but lost it as well building the Santa Prisca Church. Just before we began our ascent, we got delicious servings of tacos in a neighborhood tacqueria a few meters from the station, probably among the best we had during our Mexico journey. It was Holy Thursday and a motorcade of honking trucks jampacked with people followed an image of the crucified Christ that was led by several men on horses. 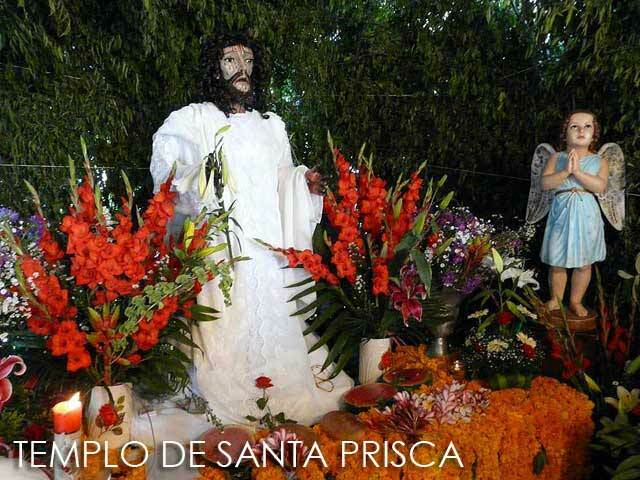 Holy Week is one big fiesta in Mexico, as I would further discover in the next few days. 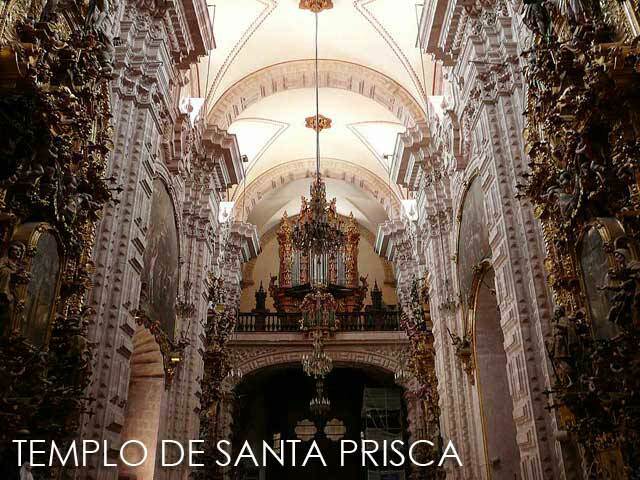 Back to Santa Prisca. 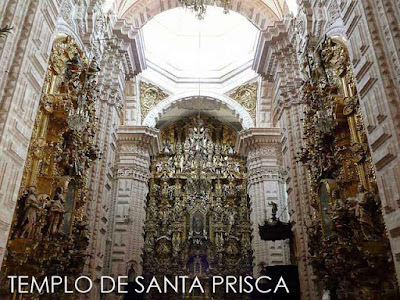 It's popularly referred to as the Catedral de Santa Prisca although it's not a cathedral. My jaw dropped to the floor as we walked in the church. The interior was an impressive assemblage of twelve exquisitely carved wooden altars generously covered with gold leaf. It was a fine example of Mexican Baroque religious art. 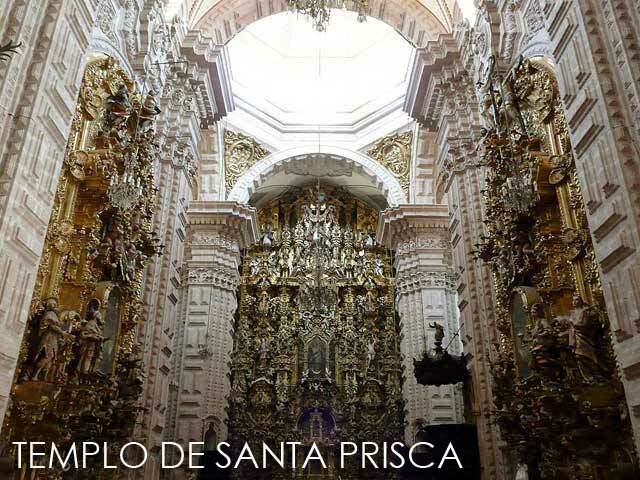 The main altar or retablo mayor is dedicated to the Purísima Concepción and the patron saints of Taxco de Alarcón: Santa Prisca and San Sebastián. The exterior is equally impressive with twin belfries built in the Churrigueresque style. They were the tallest structures in Mexico from 1758 to 1806. Outside the church, a makeshift hut was built for Holy Thursday veneration of the image of the Agony in the Garden. The Garden of Gethsemane is recreated in the front atrium of Santa Prisca. We wanted a grand view of Taxco and we were told that we could take a combi all the way to the Guadalupe Church. 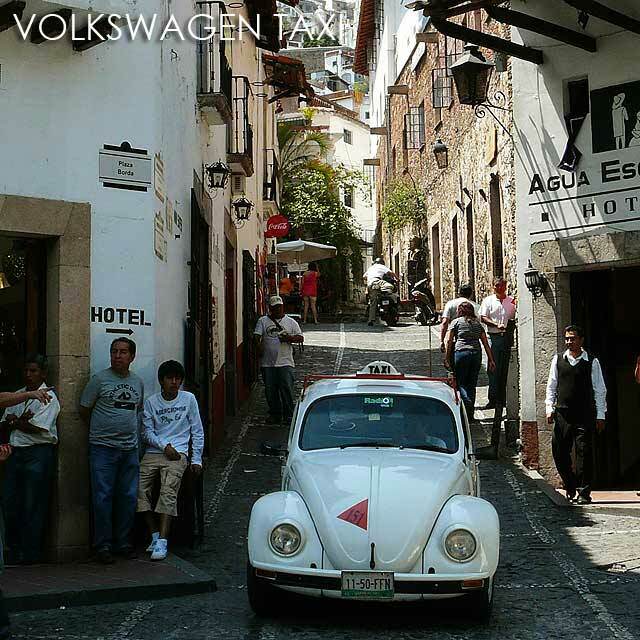 We spent MX$4.50 for the ride through Taxco's winding streets that would turn, climb, descend and even drop at times. Drivers have mastered the art of speeding through these capricious single lane streets without hitting vehicles moving in the opposite direction. It was a view worth the ride. 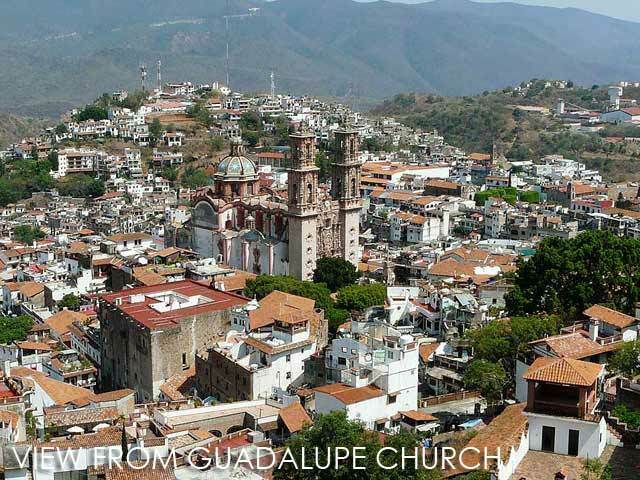 And whenever we could, we would later try to enjoy other towns we visited from high vistas to enjoy spectacular and panoramic views of Mexico's old towns. Back down, we walked around town while waiting for our bus. There were very interesting vistas and pathways at every turn. Too bad we missed the evening Recorrido de los Soldados Romanos since our bus was left 30 minutes before it started. But we did see locals dressed as Roman soldiers making their way to the church. 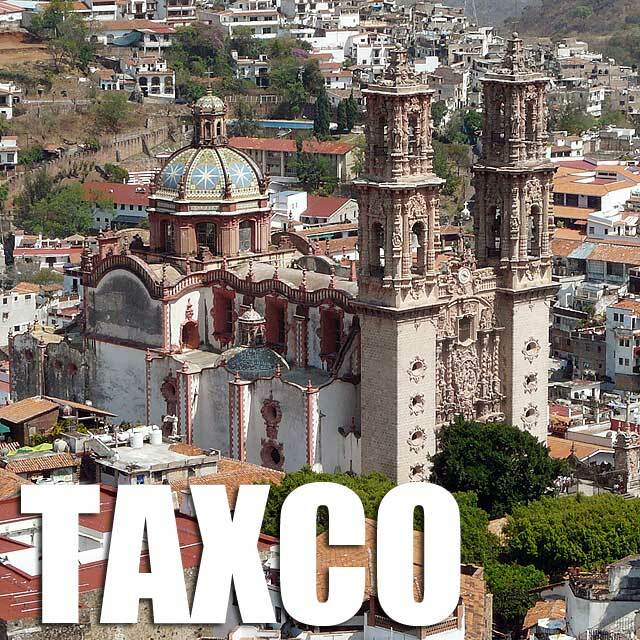 For more photos of Taxco, check out Ivan About Town in Facebook. Taxco has processions everyday from Palm Sunday to Easter Sunday. 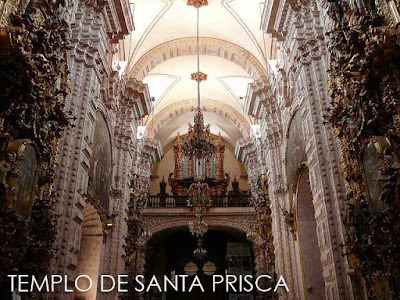 Here is a list of activities in the Parroquia de Santa Prisca y San Sebastian A. R. de Taxco during Holy Week or Semana Santa. Times are based on the 2011 schedule. But I would assume that they are the same every year.